Romania's Simona Halep reacts during her third round match against Taiwan's Su-Wei Hsieh. 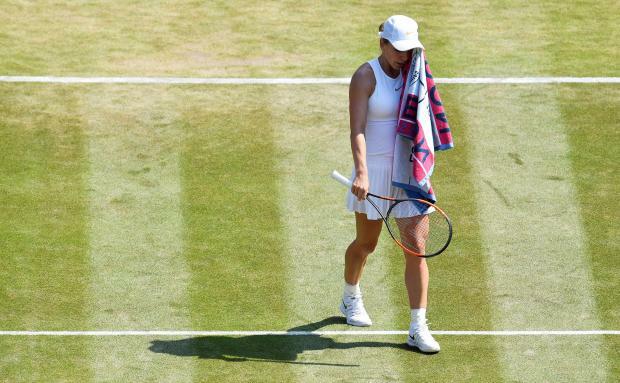 Women's top seed Simona Halep crashed out in the third round of Wimbledon on Saturday when she was beaten 3-6 6-4 7-5 by Taiwan's Hsieh Su-wei. The Romanian world number one, who claimd her first Grand Slam title at last month's French Open, never got to grips with the tricky 32-year-old who battled back from 5-3 down in the deciding set to claim a stunning victory. A weary-looking Halep ended the match with successive forehand errors. Her defeat means only one of the top 10 seeds has reached the last 16 in the women's draw.